Bangladeshi polling officials count ballots shortly after voting ended at a polling station in the ancient city of Panam Nagar, about 20 kilometers (12 miles) southeast of Dhaka, Bangladesh (Dec. 30, 2018). Bangladesh’s ruling alliance won virtually every parliamentary seat in the country’s December 30 general election, according to official results released Monday, giving Prime Minister Sheikh Hasina a third straight term despite allegations of intimidation and the opposition disputing the outcome. 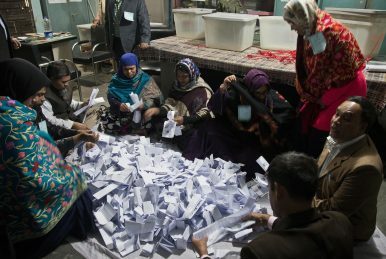 Previously, Bangladesh’s elections had been organized and held under a nonpartisan caretaker government, a system designed to prevent the ruling party from manipulating the vote. The Awami League abolished the caretaker government system through a constitutional amendment in 2011, despite protests from the opposition. Chief Election Commissioner K.M. Nurul Huda ruled out any revote, saying there were no reports of large irregularities. Hasina’s main rival for decades has been former Prime Minister Khaleda Zia, the leader of the opposition Bangladesh Nationalist Party (BNP). This year, however, a court deemed Zia ineligible to run for office because she is in prison for alleged corruption. In Zia’s absence, opposition parties formed a coalition led by Hossain, an 82-year-old former member of Hasina’s Awami League. Hasina met political leaders and senior military and civil officials at her office on Monday, the United News of Bangladesh agency reported. It said Indian Prime Minister Naredra Modi telephoned her and promised to continue to support Bangladesh under her leadership. The opposition says Hasina’s leadership has become increasingly authoritarian. More than a dozen people were killed in election-related violence on Sunday, and the election campaign was dogged by allegations of the arrest and jailing of thousands of Hasina’s opponents. Hossain said late Sunday that about 100 candidates from the alliance had withdrawn from their races during the day. He said the alliance would meet Monday to decide its next step. “We call upon the Election Commission to declare this election void and demand a fresh election under a nonpartisan government,” Hossain said. By Julhas Alam and Emily Schmall for the Associated Press, with additional reporting by The Diplomat. Time for the US to Stop Ignoring BangladeshGlobal Support Lets Bangladesh Prime Minister Withstand Election ConcernsThe Bell Tolls on Bangladesh's DemocracyAttack on Opposition Leader’s Motorcade Adds to Pre-Election Violence in BangladeshCan an Aspiring Political Movement Upend the Bangladeshi Elections?